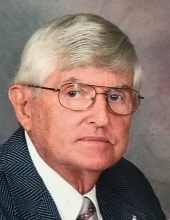 Mr. Milton Read French, age 87, of White Oak, formerly of Burbank, CA., passed away on Tuesday, January 29, 2019 at his home. His illness was sudden, and he passed a week after he feel ill, and hours after his diagnosis was confirmed, as Diffuse large B cell lymphoma. Milton was born in Burbank, CA., on July 2, 1931 to the late Walter S. and Marion Read French. Soon after graduating from high school, he joined the U.S. Army, serving honorably, as a battlefield stenographer, during the Korean War, preparing and sending the battle reports and orders from the front lines. Once he completed his service to his country, he returned to Burbank, and married the former, Marilyn Fretz on January 25, 1958 at the First Methodist Church in Burbank. Together they owned and operated French Graphics of Burbank as commercial artists, creating art for commercial printing, and television studio tickets and advertising. He was of the Methodist faith, and a former committee member of the Burbank Historical Society. While living in Burbank, he enjoyed hiking in the hills and mountains of California, hosting pool parties, and traveling to Colorado with his wife and family. In his leisure time, he painted with oil pastels, and was an avid reader, who enjoyed history,and learning until his last days. He loved to swim, enjoyed polka music and dancing, and attending gun shows. He was a loving husband and father, with a infectious sense of humor. He is survived by his loving wife, Marilyn French of White Oak; son, David Read French of Portland, OR. ; daughter, Regina Mattingly and husband John of White Oak; brothers, Wesley Dean French and wife Dottie of San Jose, CA., Dennis French and wife Carol of Beijing, China; four grandchildren, Michelle Longoria and husband Ezekiel, John Mattingly, II., Kirk Mattingly and wife Brittany, Anthony Mattingly and wife Wendy; six great-grandchildren, Maverick Youngblood, Alexander Bishop, Victoria Bishop and fiance Ryan Bishop, Brayden Mattingly, Hayden Mattingly, Kayden Mattingly; four great-great-grandchildren, Gracelynn Youngblood, Maverick Youngblood, II., Olivia Youngblood, Lena Sellers; niece and nephew, Jim and Elizabeth Rose. A celebration of Milton’s life will be held at 2:00 PM on Sunday, February 3, 2019at Croley Funeral Home of Gladewater,with Mr. Timothy Lewis and Milton’s family conducting; Interment will follow the New White Oak Cemetery, with Maverick Youngblood, Alexander Bishop, Ezekiel Longoria, Dennis French, Anthony Mattingly, and Jim Rose serving as pallbearers. The family will receive friends from 6:00 until 8:00 PM on Saturday, February 2, 2019 at Croley Funeral Home of Gladewater. To send flowers or a remembrance gift to the family of Milton French, please visit our Tribute Store. "Email Address" would like to share the life celebration of Milton French. Click on the "link" to go to share a favorite memory or leave a condolence message for the family.